Law enforcement officers talk as a car is towed away in the Mt. Zion High School parking lot as part of an investigation into a shooting Friday, May 18, 2018, in Jonesboro, Ga. The lot was being used as an overflow lot for the Perry Learning Center Graduation when the incident occurred. One person was killed and another wounded when an argument led to a shooting outside a high school graduation ceremony Friday night in metro Atlanta, police said. One person was killed and another wounded when an argument led to a shooting outside a high school graduation ceremony Friday night in metro Atlanta, police said. The incident happened as people headed to their cars, Clayton County schools' safety chief Thomas Trawick said. He said he couldn't provide details about the injuries and had no information about any suspects. The shooting followed a ceremony for graduates of the Perry Learning Center, which prepares students for careers as an alternative to traditional high schools. It happened on the campus of Mount Zion High School, which provided overflow parking for people attending the ceremony at the Clayton County Schools Performing Arts Center in Jonesboro, about 20 miles (32 kilometers) south of Atlanta. Officials told NBC's 11Alive News that a woman in her 40s died after she was shot three times in the chest. She was taken to an area hospital but was later pronounced dead. Trawick said his initial reaction "wasn't pleasant," given news of a fatal shooting earlier in the day in Texas. "The last thing you want to do is have a situation at a graduation that results in anyone being injured, and definitely not being shot," he said. The school district's superintendent in a statement Friday night said they are "saddened that such an incident has occurred that overshadows such a positive ceremony involving an exceptional group of graduating seniors." 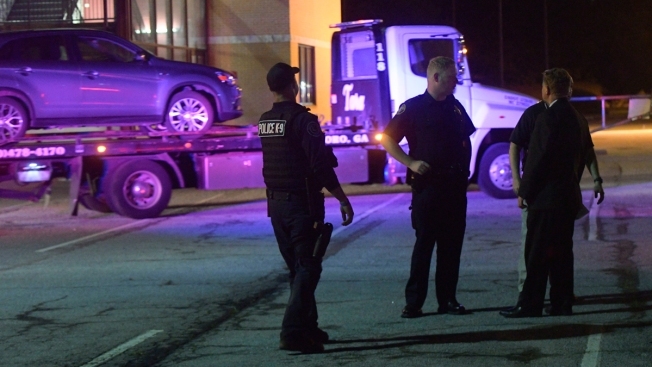 A police presence remained at the scene late Friday night. Three cars were being towed away; Scott Stubbs of Clayton County police said they'd be part of the investigation. But he and other officers on the scene said they couldn't release any further information.